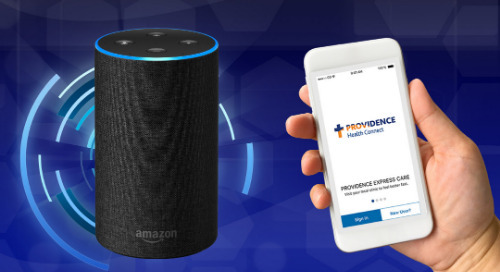 This is the fifth in a series of articles about how the Providence St. Joseph Health digital team is helping you get care how, when and where you need it. We’re constantly innovating to provide care that’s both high-quality and convenient. One such product is Express Care. Express Care is all about getting health care when and how you want it, quickly and without all the hassle of traditional doctor’s office appointments. The infographic accompanying this post serves to highlight the differences between the three Express Care choices. One choice is our Express Care Virtual. This is like having a doctor’s appointment via FaceTime. You use your phone, tablet or computer to have a video chat in real time with a health care provider. This service is good for health issues that don’t require a visit in person. A second option is our Express Care Clinics. These are in-person health care visits at one of our brick-and-mortar locations for non-emergency medical needs. Some of these are conveniently located inside of Walgreens stores, where you can also pick up your prescription. Clinics accept many insurance plans. A third option is our Express Care at Home service. This is a house-call care provider who comes to visit you in person at your home, in your hotel or at work. The three Express Care options are part of our effort to provide convenient care that works best for our customers. Please note that Express Care services aren’t yet available in all of our service areas. Be ready when you need care. Download the apps from the Apple Store or Google Play. Read on for news on thermostats, bicycles, espresso, heart flutters and vegetables.